The story goes that they bend over and Cop-it off the Police Service. If they don't they don't get all the stories first hand. Nor do they get work (advertising) off the Government unless they produce lies and propaganda as well. So bend over, and cop this. 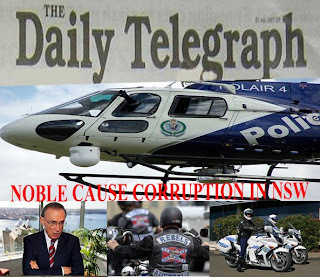 I sent your paper articles in relation to the Loser Gang (bikies) in particular Rebells, Polair and off duty police working together. I picked up your Saturday edition 6 April 2002 while sitting on a park bench.There it was a racist article in relation to a list of so called ethnic (labels) gangs in our schools. But I didn't see the Loser Gang the agents who sell heroin and guns and employ youths and children in our schools. I did not see anything in relation to the fact that the Police Service Green light these bikies and in fact work with them off duty. Perhaps if you want to give out Blue Ribbons to police who die in the line of duty then tell us why the constable was driving in an unmarked Police vehicle. Then you can go on and hand out Red Ribbons to the fireman who died in the line of duty. Then you can hand out Crimson Ribbons to all the Children who died because the Police Service sold them heroin in the line of their Survival. What about Purple Ribbons to all the Garbage collectors who are nocked down and killed by motorists in the line of their work. What about Green Ribbons to all those Prisoners set up incarcerated and killed in the line of their Survival.You can go on to hand out Black Ribbons to all those people Murdered by Police and Civilians alike. Only then can you tie a Yellow Ribbon around the Old Oak Tree. Then we wont end up with another hit squad purported to be required because of the so-called alarming guns culture. Police who will spend there time stalking innocent citizens instead of policing. I might add what about real police work. Perhaps they could take over and thoroughly investigate unsolved murders. ED: Sunday is Sunday without the Daily Telegraph Ruff Ruff.